Alex Jones, the right-wing conspiracy theorist who has repeatedly suggested the Sandy Hook Elementary School shooting was a hoax, was sued on Tuesday by three parents whose children were killed in the 2012 massacre. 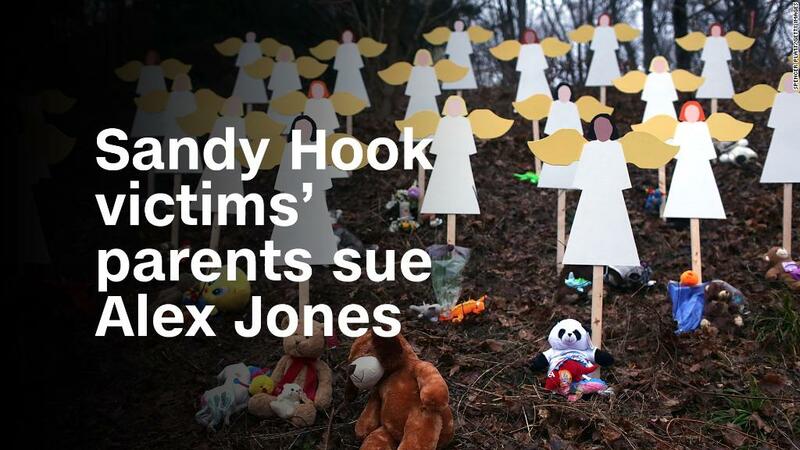 It's the first legal action taken against Jones for the false claims he has made about Sandy Hook. The two lawsuits were filed by Leonard Pozner and Veronique De La Rosa, and Neil Heslin. Their respective six-year-old sons, Noah Pozner and Jesse Lewis, were fatally shot at Sandy Hook. The suits were both filed in Travis County District Court in Austin, Texas, where Jones operates his fringe website InfoWars, which was also named as a defendant in the lawsuit. Each lawsuit seeks at least $1 million in damages for "a severe degree of mental stress and anguish" and "high degree of psychological pain" the parents suffered from Jones' coverage, in addition to past and future damage their reputations might suffer. "Defendants' defamatory publications were designed to harm the Plaintiffs' reputation and subject the Plaintiffs to public contempt, disgrace, ridicule, or attack," the lawsuits allege. "Defendants acted with actual malice. Defendants' defamatory statements were knowingly false or made with reckless disregard for the truth or falsity of the statements at the time the statements were made." Related: Will the spate of lawsuits against fringe media stop the flow of conspiracy theories? For years, Jones has suggested that the Sandy Hook massacre was a "giant hoax" carried out by crisis actors on behalf of those who oppose the Second Amendment, the amendment in the Bill of Rights that provides American citizens the right to bear arms. To make this argument, Jones has attempted to suggest that news coverage of the Sandy Hook massacre was staged. This continued into April 2017 when Jones aired a segment called "Sandy Hook Vampires Exposed." In it, he falsely suggested a technical glitch during an interview with De La Rosa was evidence of the use of a green screen. "We've got Anderson Cooper, famously, not just with the flowers blowing and a fake, but when he turns, his nose disappears repeatedly because the green-screen isn't set right," Jones said. The lawsuit said the assertion De La Rosa "participated in a faked blue-screen interview from a remote location is manifestly false." It called the claim a "sick lie" that Jones has pushed and says, "The visual effect described by Mr. Jones is the result of motion compensation video compression, which would have been readily ascertainable at the time Mr. Jones made his claims." Months later, on June 18, 2017, Megyn Kelly aired a profile of Jones on NBC and interviewed Heslin for her piece. Responding to the claim Jones had pushed about Sandy Hook being staged, Heslin told Kelly, "I lost my son. I buried my son. I held my son with a bullet hole through his head." Days after Kelly's profile, InfoWars personality Owen Shroyer said it was "not possible" Heslin held his child and saw the bullet hole in his head because the medical examiner had said parents identified their deceased children using photographs. The lawsuit, however, notes that "parents were permitted to see and hold their children soon thereafter." In a freewheeling 10-minute video posted to YouTube on Tuesday, Jones responded to the lawsuits, saying his lawyers are "very, very confident" they are "frivolous" and "will be thrown out" of court. "They will be dropped because they have no merit," Jones said. Jones said, without evidence, the families suing him were "roped into this" by the national media, and that his "heart goes out to the families being used by these organizations behind this," though he didn't name any specific entities. Jones lampooned the "corporate media," accusing journalists of taking him "out of context" to "deceive" the public. He said he had "many debates" after the Sandy Hook shooting and would play "Devil's advocate" during discussions, and that the media "seized on those clips" to "misrepresent" what he said. Jones said he believes the children actually died during the massacre, but had "questioned the [public relations], the talking points that surrounded the Sandy Hook massacre." "I ask the American public, I ask the families of the Sandy Hook victims, to actually admit that I've invited you on for years, and admit that I've said for years that it really happened," Jones said. "And that if I caused you any pain by debating both sides of it, which is our right as a First Amendment nation, I'm sorry for your pain. But this is a big public event that has been seized on publicly to take our rights. So this is something we've had to do." A representative for InfoWars did not respond when asked if Shroyer had a comment.